EMCC students complete the "When I Graduate" wall to declare their goals after graduation. 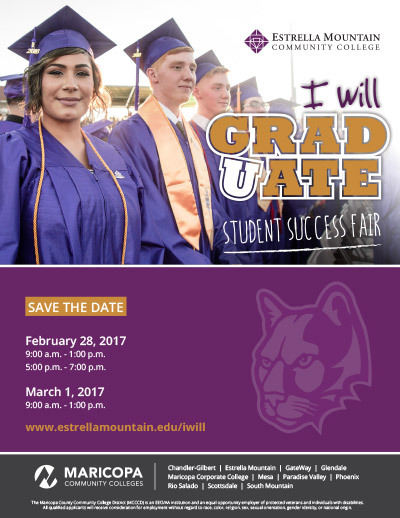 Aligned with the Estrella Mountain Community College’s (EMCC) “I Will Graduate” philosophy that promotes degree completion with goal-setting strategies, the annual Student Success Fair provides students a chance to learn about opportunities that empower them on their path to success. The event provides individualized information and tools that allow students to learn about valuable college resources, programs and services that promote a rewarding college experience, and are also helpful in achieving post-graduation goals from university transfer to entering the workforce. The two-day Student Success Fair kicks off from 9:00 a.m.-1:00 p.m. on Tuesday, Feb. 28, with an additional evening session from 5:00-7:00 p.m.; and 9:00 a.m.-1:00 p.m. on Wednesday, March 1. EMCC encourages high school and prospective college students, as well as parents, families and other student advocates, to attend the Tuesday evening event, as it includes additional resources for future college attendees. All three sessions are held on EMCC campus grounds and courtyards, located at 3000 N. Dysart Rd., in Avondale. The event is free and open to the public. To encourage maximum interaction with staff, faculty and student representatives, students are guided through an interactive experience using a personalized passport that leads them through different zones and helps build personal networks around the college. These designated passport zones help students identify individualized requirements and resources for college completion, and when their passport is full, they receive a free, customizable EMCC T-shirt to declare their graduation date and to show off school pride. In addition to acquiring information about college programs and services, students can learn about campus clubs and activities, declare a graduation date and major, learn about career readiness programs, visit with dozens of university transfer representatives, and engage in opportunities to win other fun prizes. The Student Success Fair is an engaging and welcoming event that helps current and future students increase their comprehension of necessary college procedures. Whether on the path to enrollment or graduation, the event is designed around EMCC’s commitment to help students achieve their goals and overcome obstacles by providing support at every turn. Now in its fifth year, the event continues to grow, serving more than 4,000 students to date. For more information, visit www.estrellamountain.edu/iwill.